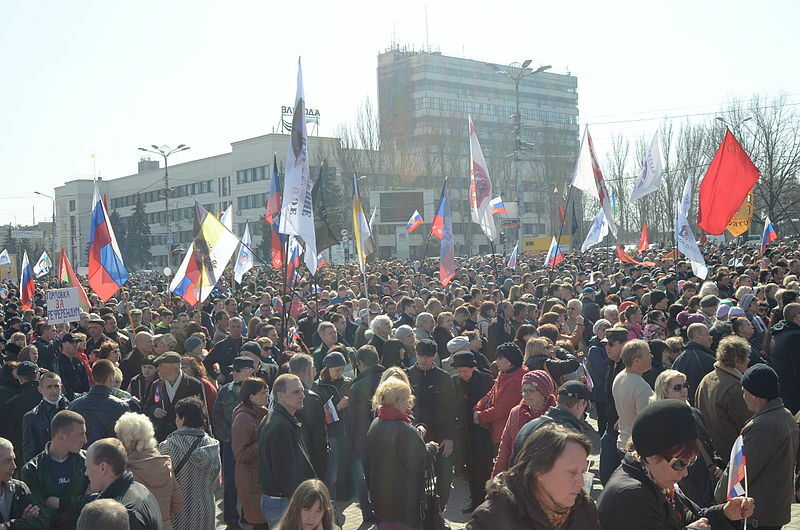 Wikipedia labels these events as "2014 pro-Russian unrest in Ukraine". 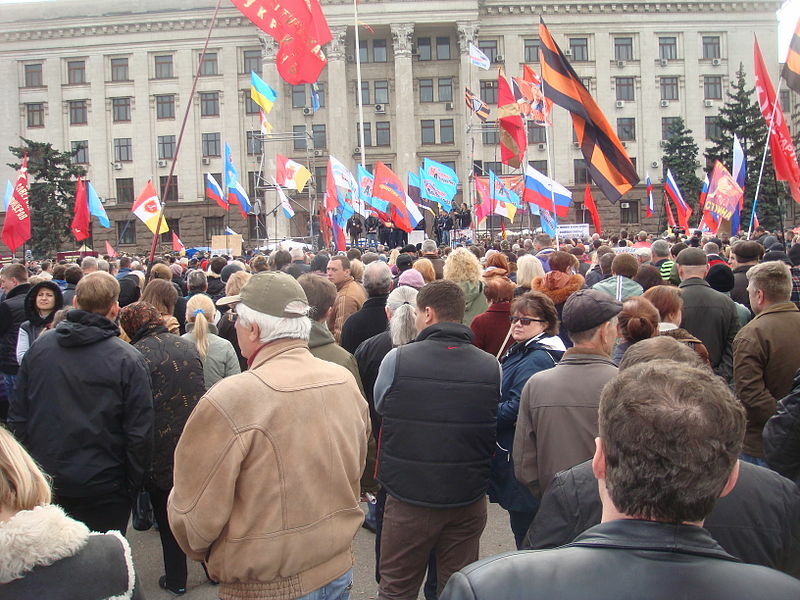 Since the end of February 2014, demonstrations by pro-Russian and anti-government groups have taken place in major cities across the south-eastern regions of Ukraine, in the aftermath of the 2014 Ukrainian revolution and the Euromaidan movement. Various Russian news media outlets have used the term "Russian Spring" to describe the protests. 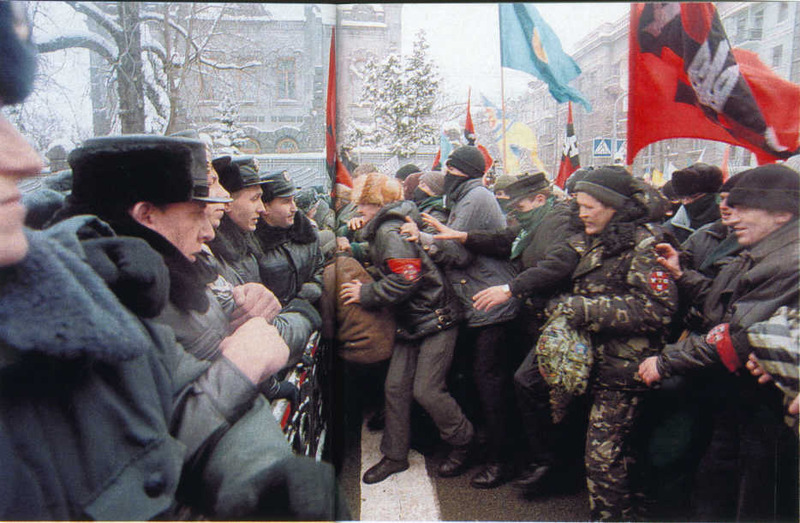 The protests have since escalated into an armed separatist insurgency. 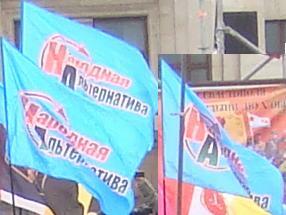 During these protests, several pictures are seen showing flags of various sorts. Most of these are unknown (at least to me) or are unidentified. I hope we can all identify them. 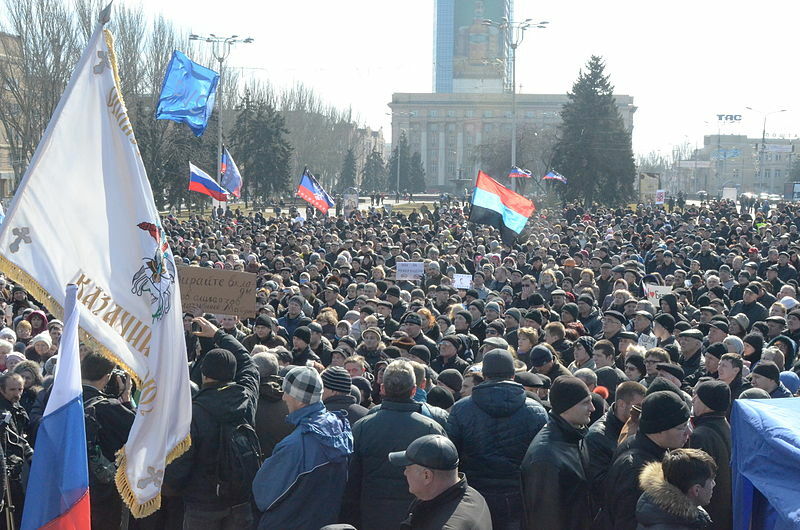 Pictures: #1 - Pro-Russian demonstration in Odessa, 13 April 2014, #2 - Pro-Russian protesters in Donetsk, 5 April, 2014, and #3 - Pro-Russian protesters in Donetsk, 8 March 2014. Red flag with star and inscription (possibly in cyrillic). Red flag with logo in the middle. Blue and black UFE with emblem in the middle. Light blue UFE with inscription (possibly in cyrillic). White UFE with inscription (possibly cyrillic). Orange black UFE with CoA in the middle (the orange and black colors resembling the Order of Saint George, which is awarded to "to top and senior military officers for the conduct of military operations to protect the Fatherland in the case of attack by an external enemy which resulted in the complete defeat of the enemy, for the execution of combat and other operations in other states aimed at restoring international peace and security, for being a model of military science with feats that exemplify military prowess, and who were previously awarded state awards of the Russian Federation for distinction in combat." Crimsom UFE with Coat-of-Arms in the middle. White UFE (possibly St. George). Not St.George. 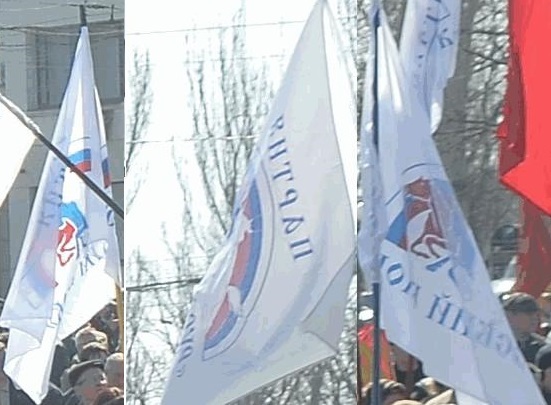 There are three running horses and the rainbow Flag of Political party "Russian Block"
White UFE with inscription in red and emblem in the middle which seems to be St. George). I speculate that Ukrainian UFE Flag #2-2 appears to be a variant of the United Rus flag. It has the United Rus shield centered on it. Black UFE with white letters. 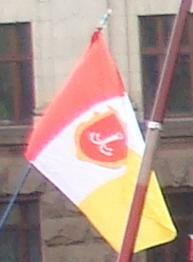 Red UFE flag with white inscription. This is a variant of the flag of Communist Party of Ukraine, with white charges instead of yellow/gold and inscription *KOMPARTIYA UKRAYINY* in two rows (the variant already presented at the FOTW-ws has the inscription "KOMUNISTICHNA PARTIYA UKRAYINY" in three rows). Blue gonfallon with black inscription. rather "yellow gonfalon with inscription, possibly Georgian". In fact it is not georgian inscription. The words written in cyrillic with semi-ancient font. It is the flag of public organization "Faithful Cossacks" (rus. - VERNOE KAZACHESTVO) (http://www.vernoe-kazachestvo.org.ua/) They use different types of flags - crimson, black, dark-yellow. White UFE with religious images on it (crosses on all four corners, plus what seems to be St. George in the middle). Blue UFE with white inscription (maybe ciryllic). The inscription is not completely visible, but almost certainly, it is RUS' (РУСЬ), the ancient name for the predecessor state of present-day Russia: http://en.wikipedia.org/wiki/Rus_(name) It is nowadays used not only by the pro-Russian political forces in Ukraine, as here (to denote that the area, Donetsk in this particular case, has always been a Russian land), but also by some of Ukrainian ultra-nationalists, who claim that Ukraine and Ukrainians are the only true successors of the Rus state and Rus people, the Russian claims to any kind of the continuity being denoted as the usurpation. I'm calling this the "St. George's Ribbon Flag" (in order not to confuse it with the old St. George´s Cross Flag, flown by the Imperial Navy). I'm attaching a picture. There's another flag with St George's stripes, which I labelled "St George's Flag II". I don't know who's using it. 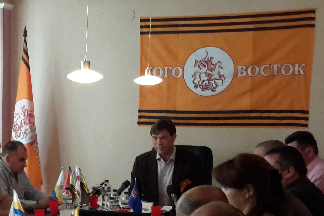 That is the flag of "South East" Movement leaded by Oleg Tsarev. I downloaded a picture of a Ukrainian rally with a flag that I've been unable to identify so far. Please take a look at this picture and my drawing and let me know if you can identify it. Prior to the Russian Invasion of Crimea in 2014, there has been political unrest and protests on the Crimean Peninsula and in East Ukraine. Unhappy Russian ex-patriots have been demonstrating there ever since the breakup of the USSR and Ukrainian independence. We've gathered up some earlier contributions to the list about unknown flags used during these earlier demonstrations and include them here - Ed. - Flag of the UNSO. 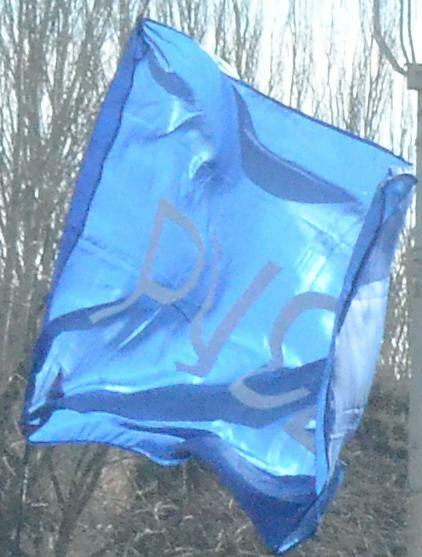 - A pale blue flag with some yellow device. Maybe OUN. 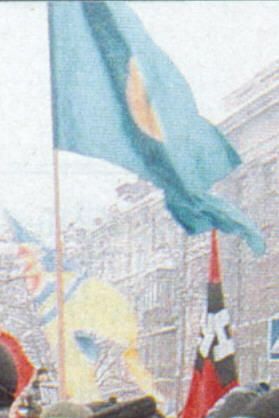 - A yellow flag with a variant of the Ukrainian trident on a blue field. Photo Source: Flags found in the German weekly news magazine "Der Spiegel" (see Issue 8, February 19th, p. 139). - Blue flags (unknown) with white writings. - Yellow flags with some devices (unknown). Photo Source: Flags found in the German weekly news magazine "Der Spiegel" on Issue 8 (February 19th, p. 139). 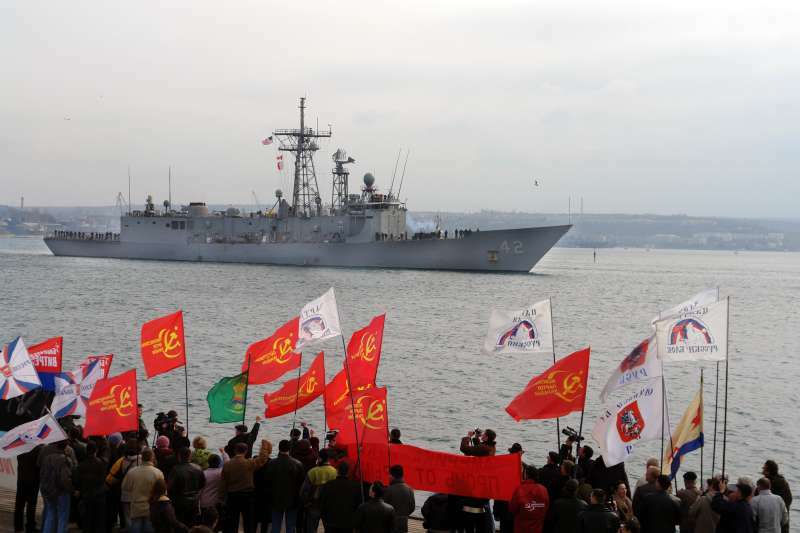 A photo of Ukrainians protesters greeting the USS Klakring at Sevastopol in March 2009. The photo includes at least 8 different (I guess pro-Russian or Soviet-nostalgist) flags, plus a Soviet naval ensign. 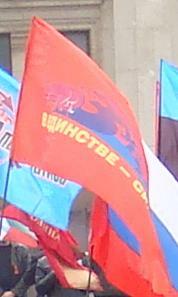 The red one is a flag of Ukrainian communist party. 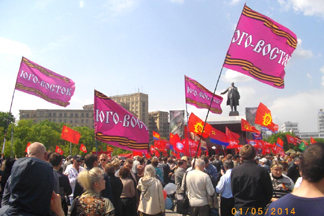 White flags with COA - flag of movement "For United Rus"
red flag in the left side - flag of pro-communist party of Natalya Vitrenko "People's Opposition"